Vow booklets are an easy way to elevate your wedding day look, add to your detail shots, and make a great keepsake you can hold onto for years to come. Your vows are really the reason for the wedding day. So it makes sense to let them have their moment! Plus vow booklets are pretty inexpensive and they are a beautiful addition to your wedding day (they look a bit better than vows written on torn out college-ruled notebook paper :) ). The value of having both of your vows written in gorgeously bound notebooks that will last for years is priceless. Here are a few vow booklets I've rounded up that I know you'll love! 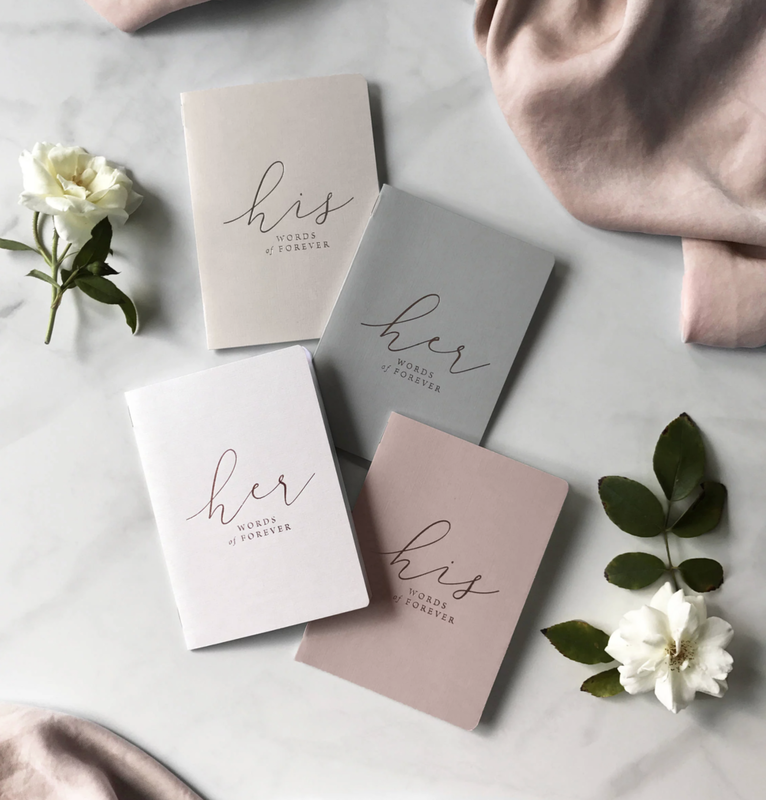 If you have a muted wedding day color palette or are looking for something subtle, these dusty colored notebooks from Etsy are perfect. Choose from Rose, Cream, Dove Grey, and Real Grey with rose gold foil depending on your preferences. You can't go wrong with any of those choices in my opinion! These booklets are perfect if you want to have a bit more control over the design. They are also a bit cheaper than some other options since they won't be bound and you need to print them yourselves. A plus for this choice is that you can actually type your vows in the template before you print! You can also change the fonts and print on whatever color paper you want! If you forgot to buy vow booklets and need to get some ASAP, these hardcover booklets are perfect! Amazon Prime can have them to you within two days! I also love that they are linen hardcover because they will be extra durable. As long as you write in ink, you'll still have these booklets at the age of 85. How sweet will it be to read your vows over and over again from these booklets? There are so many more options that you can find online or in stores! Once you start looking, it will be hard to decide which is your favorite!